We are very saddened to write that it became necessary to humanely euthanize Adelaide this past April. Early in the month we started seeing changes in her behavior. She had become increasingly agitated and spooky and several volunteers had commented about her weaving outside and seeming to be “out of it”. When the vet evaluated her, she found that Adelaide was losing her eyesight. We thought we could manage this, but over the weekend in late April, Adelaide behaved in a very dangerous manner, rearing up and using her head to hit the vet and the person holding her. The vet was very upset about this change in behavior, and concerned that she might have a brain tumor in addition to diminishing eyesight. To prevent Adelaide from hurting herself and/or those who handled her, the decision was made to humanely put her down. Thankfully, Adelaide went peacefully. 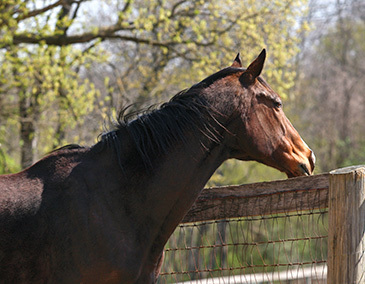 Adelaide was 16 years old at the time of her rescue in March 2010, a Thoroughbred mare, 16 hands high, and part of a hoarding case. She lived in filth without adequate food or shelter. Under Adelaide’s blanket she was skin and bones and she had badly deformed hooves from lack of farrier care. She needed to gain over 200 pounds and also needed extensive farrier work for several months after her arrival to remedy the problems. Her front and rear hooves on the left side were so deformed that Adleaide could literally not stand straight. 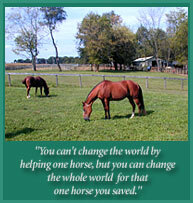 Adelaide made great progress at Mylestone, and once in restored health was made available for adoption as a companion. She was a nice mover, but due to problems never addressed with her hooves, Adelaide was not ridable. She was spunky and really came out of her shell at the farm. She was very flashy with her beautiful dark bay coat and white markings, and a real beauty once she gained the weight she needed. It was wonderful watching her gallop down the field, a far cry from the deeply depressed mare we first rescued. Adelaide did not find an adoptive home, but this beautiful and spirited mare knew a great life at Mylestone with many who loved and cared about her. See more photos and read more of Adelaide's background.